JOHNSON, JOHN (Sakayengwaraton, Shakoyen·kwaráhton, usually known as Smoke Johnson), pine tree chief of the Mohawks; b. 2 or 14 Dec. 1792 at the Johnson settlement, northwest of Cainsville, Upper Canada, son of Tekahionwake (Jacob Johnson) and his first wife; m. in 1815 Helen Martin, daughter of Mohawk chief George Martin* and Catherine Rollston (Wan-o-wen-re-teh), a white woman of Dutch ancestry captured by the Mohawks as a girl; they had a large family, including George Henry Martin Johnson; d. 26 Aug. 1886 on the Grand River Reserve, near Brantford, Ont. John “Smoke” Johnson’s father and his aunt were baptized at Fort Niagara (near Youngstown, N.Y.) in the presence of Sir William Johnson*, the superintendent of northern Indians, who evidently suggested his own name as a suitable surname for the children and acted as their godfather. 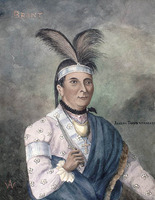 Nevertheless, Jacob used his Indian family name, Tekahionwake, throughout his life; John “Smoke” Johnson was the first of his family to use the English name. His Indian name translates as “he has made the mist disappear for them.” This mist, known to the Mohawks as smoke, provided Johnson with the name by which he was generally known. A full-blooded Mohawk of the bear clan, Johnson in his youth was well acquainted with Joseph Brant [Thayendanegea*] and they were both regular attendants at the Mohawk Church, near Brantford. 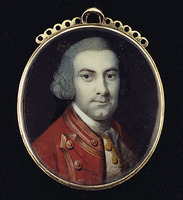 Johnson fought with the British in the War of 1812 as a young warrior, probably under John Norton*, in battles at Queenston Heights, Stoney Creek, and Lundy’s Lane. Apparently Johnson was the man who kindled the fire that burned Buffalo on 30 Dec. 1813. For these military services he was later awarded a pension of $20 per month. 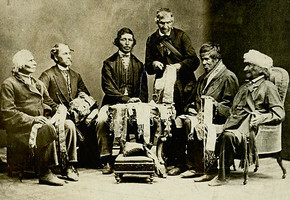 In 1869, when the young Prince Arthur* was inducted as an honorary Six Nations chief, Johnson and Skanawati (Chief John Buck) were appointed by the great council to conduct the ceremony, at which Johnson’s son, George, acted as interpreter. In a sense, this marked the end of Johnson’s active public career, in his 77th year. Physically and mentally active until his death at 93, he became the “grand old man” of the Six Nations community. Long interested in his people’s traditional ways, though a staunch Anglican all his life, by the early 1880s Johnson was reputed to be the only man left who knew the meaning of the entire Iroquois Book of Rites. His last years were marked by the unfortunate loss of the last manuscript of that work. In 1832 he had made a copy of the Book of Rites at the request of the elderly owner of the only extant copy. This action was fortunate, because soon afterwards the first copy was lost in a fire. In 1883 the philologist Horatio Emmons Hale published a work about the Book of Rites, using the Johnson copy. The following year, an American, Mrs Erminnie A. Smith, bought his copy from Johnson for $10 and refused to reconsider the purchase even though several of the younger Johnsons objected that the old chief had been deceived. The copy was sold at a great profit to the Smithsonian Institution in Washington, D.C., where it remains today. Early in 1886 Johnson was asked to preside at the laying of the cornerstone of a memorial to Joseph Brant in Brantford but refused the honour because of Iroquois traditions regarding the dead. Although he did attend the ceremony on 11 August, he did not live to see the unveiling on 13 October. He died on 26 Aug. 1886 while gardening in the summer heat. John “Smoke” Johnson’s youth was spent during a happy age in the history of the Six Nations. 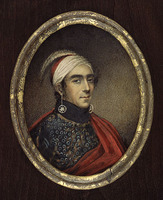 His long adult life ran from the last period of Indian warfare in eastern Canada over years when new types of threats developed to endanger Indian culture. AO, MU 1143. The Iroquois book of rites, ed. H. [E.] Hale (Philadelphia, 1883; 2nd ed., Toronto, 1963). The valley of the Six Nations: a collection of documents on the Indian lands of the Grand River, ed. C. M. Johnston (Toronto, 1964). Mrs W. G. Foster [A. H. Foster], The Mohawk princess, being some account of the life of Tekahion-wake (E. Pauline Johnston) (Vancouver, 1931). C. M. Johnson, Brant County: a history, 1784–1945 (Toronto, 1967). Walter McRaye [W. J. McCrea], Pauline Johnson and her friends (Toronto, 1947). F. D. Reville, History of the county of Brant (2v., Brantford, Ont., 1920). A. I. G. Gilkison, “Reminiscences of earlier years in Brant,” OH, 12 (1914): 81–88. E. H. C. Johnson, “Chief John Smoke Johnson,” OH, 12 (1914): 102–13; “The Martin settlement,” Brant Hist. Soc., Papers ([Brantford]), 1908–11: 55–64. Douglas Leighton, “JOHNSON, JOHN,” in Dictionary of Canadian Biography, vol. 11, University of Toronto/Université Laval, 2003–, accessed April 24, 2019, http://www.biographi.ca/en/bio/johnson_john_11E.html.